A fabulous weekend of basketball both home and overseas was capped off by the stunning performance of the Under 18 Men’s 3 x 3 team winning the gold medal at the FIBA U18 World Championships in Hungary. Tall Blacks shooting guard Corey Webster celebrated the news that he had received an invitation to attend a NBA training camp hosted by the Indiana Pacers later in the month by scoring 14 points in the Serbian Super League. His club Mega Leks beat FMP 96-82 on Tuesday to improve their record to 7-6. It was a victory that secured Mega Leks a place in the prestigious Adriatic League next season. A league that pitches the best club sides from the likes of Slovenia, Croatia and Serbia against one another. With a semi final berth secured Webster and a couple of other starters were rested in the 85-76 loss to Vojvodina a couple of days laterUnfortunately Mega Leks were dealt a bit of a pasting in game one of the best of three semi-final series against powerhouse Red Star Belgrade. Leks were defeated 109-80, giving up 58 points in the first half in a performance described by the Leks Coach as “A very bad and pale performance” – something lost in translation I think! Webster contributed 8pts/1reb/5assists, but couldn’t get going from beyond the arc shooting 0/4. Isaac Fotu already has a World Championship 3×3 gold medal safely stowed in his back pocket – part of the winning team back in 2011. Right now he has more serious matters to deal with as he is currently attending the three-day Adidas NBA Eurocamp at Treviso, Italy. 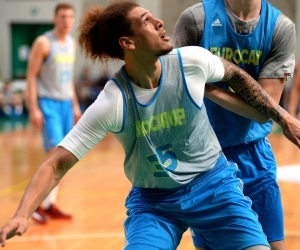 The camp, the only NBA recognized camp held outside the USA is a wonderful opportunity for Fotu to display his burgeoning talents in front of NBA coaches, staff and players. We brought news last week that Errin Rooney will be flying the Kiwi flag in Europe next season for Calais. This week we can confirm that Jillian Harmon will be returning to the Serie A. Harmon will join Italian club Le Mura Lucca. Harmon has enjoyed success in Australia and New Zealand in the past 12 months but will play her sixth season in Italy in 2015-16. Harmon helped Townsville Fire win their first Australian WNBL title in February and followed that by leading Otago Gold Rush to the NZ Women’s Basketball Championship title on Saturday. With the Eastern States enjoying a public holiday on Monday most Australian basketball leagues enjoyed a weekend break. However, over in Perth and surrounds the SBL continued in full swing. Joondalup Wolves clashed with Willetton Tigers, a game that involved three Tall Ferns, Casey Lockwood, Toni Edmondson and Lisa Wallbutton. Wallbutton was immense, celebrating her return to the Tall Ferns training squad by claiming 17 rebounds to add to 10 points for the Tigers as they comfortably won 71-65 having been 20 points ahead at three quarter time. Lockwood and Edmondson had disappointing nights scoring just half a dozen points between them. The result means that the Tigers (12/2) jump ahead of the Wolves 12/3) into second place on the SBL ladder. Another recalled to the squad is centre Megan Craig who had the satisfaction of top scoring for Lakeside Lightning with 11 points. Craig also secured 8 rebounds but bottom of the ladder Lightning (1-13) lost a very low scoring affair 51-36.